Though they were only around from 1992 to 1999, the Tear Drop Putter line was made up of a number of traditional models -- built with modern technology. The line was often rumored to have been milled by Bettinardi and, when you look at the inception of Bettinardi into the golf world (1991 was when he first started milling, but not under his own name), the dates work out pretty nicely for them to have had a hand in it. For those unfamiliar with that name, Bettinardi is one of the premier boutique putter companies in the world, with putters starting at about $300 apiece and going up -- sharply -- from there. The Tear Drop putter model TD42 is a flanged blade model with a fluted shaft and over-sweep hosel. Modeled on the same lines as the iconic Wilson 8802, this is what most of us (over the age of 50, anyway) think of when we think about a putter. The lines are simple, graceful and altogether pleasing as they come together. 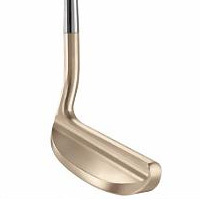 All Tear Drop putters, including the TD42, are precision milled from a block of 11L-17 cold roll stainless steel and given a soft, gold finish. The techno aspect of the Tear Drop line is the ROLL-FACE Technology that was developed to fit any player's putting stroke. Rather than the golfer adapting to the putter, the putter fits you. The precision milling puts the optimal face radius on each model in the Tear Drop line and -- if the hundreds of online comments are any indication -- produced one of the highest quality, best feeling putters ever made. Unlike many of the Tear Drop line, the TD42 is available in both a left and right hand version. Length options include 33", 34", 35" and 36" and all are fitted with a Lamkin smooth wrap putter grip and True Temper putter shaft. If you've always wanted a model 8802 -- but couldn't afford the $400+ for it -- the Tear Drop model TD42 would be a great alternative. Good examples can often be found online, and you can also try the putter barrel at your local golf shop. I have even heard of the occasional new-in-the-wrapper model turning up. Finding one might not be easy, but some digging around, combined with some patience, just might yield the result you seek. I bought a TD17 black oxide model for $11.50 this morning. I already have a TD21. I live in Japan. I think the TD21 cost $4. Awesome quality. Great website, to know thay you are playing the best shafts and great grips is a bonus, but not unexpected. To learn the S/steel designation is also super. Thank you very much for your enthusiasm. Shafts have been extended to 35.25″ swingweight went from C-7 to D-6.5, and I think that if you can find a bargain, like a Teardrop, you do not have to be scared to set the club up how you want.